I know I haven’t been posting on the blog much. My cooking has been less than inspiring lately, because I have no time to devote to it or money to spend on interesting ingredients, cookbooks, and equipment. If I’m lucky enough to get Nolan’s cooperation in the vicinity of dinnertime, I yank open the fridge and just cook the first thing that pops into my head and doesn’t need advance prep. Pitiful, I know, but it’s not much fun browsing the web and my cookbooks for meal planning with a squirmy 10-month old clamoring for my attention. This mom stuff is hard! At least I have a good little eater: Nolan has been off the pureed food for a while now, and even though he doesn’t feed himself, he wants to eat whatever we do. Chicken pad see euw is a favorite. Since I haven’t made many meals worth sharing lately, I’m diving back in my stash of notes and photos for something I baked way back in September: zucchini muffins adapted from The Good Enough to Eat Breakfast Cookbook . I’ve attempted to make her zucchini-prune bread every summer since Jeremy bought me the book in New York, round about 2005, with only marginal success: While the loaves always taste fantastic, they have always had varying degrees of liquid centers or dried out edges. The problem seemed to be twofold. First, the combination of oven temperature and loaf pan was clearly not appropriate, and my experiments with adjusting temperature and baking time were not successful. More alarming was the fact that the recipe called for 3/4 C (about 12 oz) grated young zucchini. Every single time I have ever weighed my shredded zucchini, 3/4 C amounts to nothing remotely close to 12 oz, no matter how firmly I pack it in. Since I was already having moisture issues, I mostly stuck with a heaping 3/4 C measurement and put away the scale. But my big experiment this year was to retire the loaf pan as well and make muffins, and I finally got a product I loved, and that’s saying a lot from someone who has turned her nose up at zucchini bread all her life (green flecks, eek!). They are moist and spicy, with gooey bits of prune and the crunch of walnuts—and no taste of vegetables, for those picky eaters out there. A sprinkle of demerara sugar on top would add some sparkle. Nolan was still just eating mashed avocados and bananas when I baked these, but he’ll love them if I ever have time to make them again. Grease or line your muffin pan (or use a silicone one), and preheat the oven to 325F. In the bowl of a stand mixer, cream together the sugar and butter until pale, then gradually add the oil. Stop the machine and scrape down the sides. Add the eggs and vanilla, and beat in. In another bowl, combine the dry ingredients: 3/4 C of each flour, spices, salt and baking powder. Add the dry ingredients to the butter mixture, and mix just long enough to blend. Do not leave it running! Combine the grated zucchini with the slivered prunes and walnuts, and toss with 1 T of each flour. Turn the zucchini mixture out onto the batter, and incorporate it all together gently with a spatula. 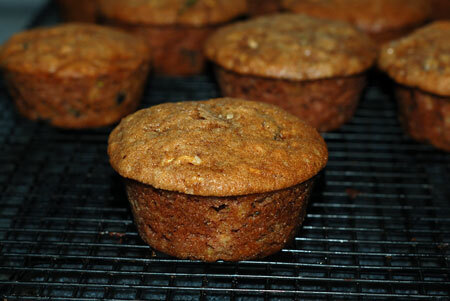 Scoop into muffin cups and bake at 325F for 30 minutes, or until they spring back when pressed gently with your finger. Cream cheese would be a lovely accompaniment, but I eat them plain. Source: Adapted from The Good Enough to Eat Breakfast Cookbook , by Carrie Levin (p. 81-82). Update 5/25/09: I made these muffins with some scraps leftover from making zucchini-wrapped halibut; I just threw the less-than-perfect strips of zucchini into the food processor and chopped them finely, then put them in my sieve over a bowl to drain off some of their excess moisture. Nolan finally got to try these muffins, and he really liked them a lot. Update 6/20/10: Jeremy requested these for Father’s Day; rather than using prunes, I diced up an equivalent amount of fresh, tender dates, and they suited the muffins perfectly. I think we actually prefer them this way. Nolan just helped himself to another muffin from the cooling rack. Update 7/28/11: We have 6 zucchini plants at my parents’ house this year, and consequently big piles of zucchini to use up. I used a 2+ pound one to make zucchini-corn fritters and had quite a bit of the shreds leftover for zippy muffins the next morning, but no prunes or dates to fold in. Instead, I went with coconut, including some coconut palm sugar in place of white, coconut oil in place of walnut, and a handful of unsweetened coconut with pecans. They tasted very good, but I was missing the extra moisture from the fruit.